A native of Marion, Dr. Scott Yancey attended the University of Findlay and graduated in 1991 with a BA Degree in Veterinary Science and a minor in Chemistry and Biology. Following his undergraduate studies, he was admitted to Ohio State University College of Veterinary Medicine and was awarded his Doctorate of Veterinary Medicine in 1995. Active in both professional and civic organizations, Dr. Yancey is member and past president of the Marion Rotary Club, past president of Marion Area Humane Society, chairman of the board of directors of the Marion Community Foundation, board member of the Marion Area Chamber of Commerce, member of the Ohio Veterinary Medical Association (OVMA), member of the American Veterinary Medical Association (AVMA) and member of the Marion Area Veterinary Association. 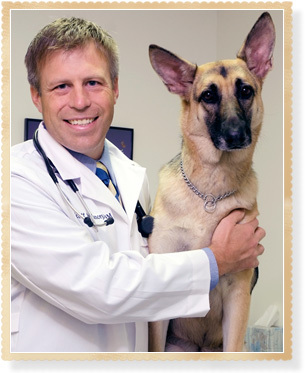 A general practitioner, Dr. Yancey established The Yancey Clinic of Veterinary Medicine in 1998. He enjoys all aspects of veterinary medicine and has special interests in surgery, dentistry and dermatology. Dr. Yancey has always wanted to become a veterinarian and enjoys the challenges involved in helping improve the lives of the pets who are involved in our daily life. The most rewarding part of his job is seeing the joy and experiencing the emotion when a sick pet gets well and is reunited with his or her family. Outside the clinic, Dr. Yancey has numerous past-times and interests. Most of his favorite activities involve hitting, catching and / or throwing a ball. He enjoys golf, tennis, scuba diving, snorkeling and refereeing high school basketball games. Dr. Yancey is married to Tina, a former teacher and tennis coach. They have three children, Hunter, Alex, Romy and an Old English Sheep dog, Wellington. Hunter enjoys soccer, swimming, golf, tennis, playing with his cars and taking care of his little brother and sister. Alex's hobbies include going for walks, riding his scooter and playing whatever sports he can. Romy loves dancing, Yo Gabba Gabba and playing with her brothers. Tina is the life coordinator for all three children, dog and Dr. Yancey. 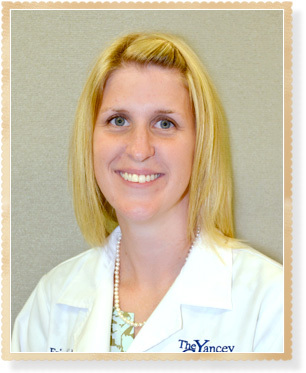 Dr. Erica Schieber joined The Yancey Clinic of Veterinary Medicine in August 2013. She is a native of Montpelier, Ohio. "Growing up on a small farm in northwest Ohio made me interested in animals and their care," she explained. "As a teenager, I was employed as an assistant at a veterinary clinic and from there on I was hooked. I love the diversity in cases of general practice, the people, and the pets. There is nothing more rewarding than spending a work day enjoying the clients, working through the 'problems' the family pet might be having, only to come up with a solution for the better." Dr. Schieber earned her bachelor's degree in biology from Capital University and her Doctorate of Veterinary Medicine from Ohio State University. Her areas of professional interest include dermatology, nutrition, and internal medicine. She is a member of the American Veterinary Medical Association. Outside her work at the clinic, Dr. Schieber spends her time with her husband Josh and their two children, Brooke and Ryan. Brooke is especially fond of chasing cats and cows, coloring, and princesses, while her younger brother Ryan excels at cracking jokes, climbing, and playing in the dirt. The family has a menagerie of animals in their care, including Bodie, a wire fox terrier; Peanut, a Pomeranian; a "gaggle" of cats (Mindy, Fynn, Wolfie, Trucker, Princess, and Pete); and chickens, pot-bellied pigs, guineas, and cattle from their hobby farm. Dr. Schieber also enjoys biking, hiking, and gardening.